The vicious cycle and the single girl. Last week I spent days -- yes, days -- writing a new post for this blog. It was a post about a discussion that happened in class at rock camp in August, and I completely threw myself into it. And then…I decided to not post it. I read it back, and decided that even after days of writing it, I just didn't like how it had turned out. I wish that I could say that this was an isolated incident, or even a routine occurrence of the "they can't call be winners" phenomenon that every artist is (or should be) familiar with. But it's bigger than that. Things have quiet around here for over a month because lately, I don't like anything that I write. Lately, everything I write seems stale and boring, and I can't bring myself to think that anyone might want to read it. And I get that even at what I consider my best, readers, perhaps even most people, will still find my work uninteresting. But at least I used to like what I was writing. It's not just the finished product, either. Lately, I've found it difficult to enjoy the writing process. I used to feel that I had gotten the hang or, and was maybe even getting pretty good at blogging. I was comfortable with each step of the process, the scribbling down of a few ideas for a post, the shaping of those ideas into an outline, the filling out of the outline, and then the editing and publishing. I used to be able to do it in a few hours spread out over two or three days. But right now I can't even think about that process without feeling overwhelmed, and can't imagine how I used to do it regularly. So, here is where I find myself: I feel like I can't write a decent blog post about something pertinent to this blog. So I don't. And then not writing reinforces my feelings of anxiety and inadequacy. Which leads to leads to more not writing (or doing anything else productive, for that matter). Which leads to more bad feelings, and so on, and so on, and so on…. 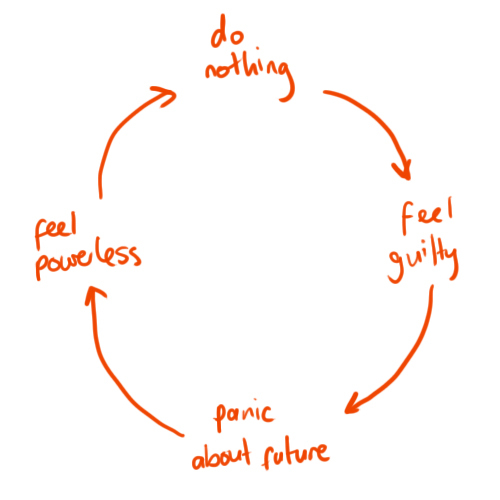 As illustrated by this handy diagram, this is a cycle. It has no beginning and it has no end, so how do you stop it? How do you interrupt the cycle of unhappiness and unhappily doing nothing about it? Trying to answer this question has unexpectedly brought me back to one of the central concerns of this blog: access. This blog has always looked at the way gender affects a person's participation in music, and I've tried to consider how gender intersects with gender presentation, sexuality, nationality, race, and class. Now, I find myself wondering how access and one's ability to participate is affected by one's emotional health or well-being. To be told to simply not have a certain feeling is pretty much the least helpful advice you'll ever receive. But people still do this, I think because we as a society don't take emotions or emotional health seriously, and we don't know how to deal with it when we have these problems ourselves, and we definitely don't know how to handle it when someone right in front of us is struggling. We don't know how to respond when our friends tell us that they are in pain. So we say stupid, unhelpful things. Or, we try to crack clever cultural references, or we steal them from movies like Reality Bites. "Man," we say to each other, "you are like in the bell jar." Because we don't know what else to do or say. Girl, you don't even know. Image: a light-skinned, dark-haired woman in a yellow paisley shirt accurately summarizes an unseen character's emotional condition. I wonder on a regular basis how much of an impact this social resistance to dealing with emotions has on girls and young women (and also, young men). It's easier for me to think structurally, and to worry about other would-be female artists of all types and their inability to get work done, than it is for me to think about my own problems. It's easier to ask myself, "What advice would I give to a friend, or to a student, who's struggling?" than it is to ask myself what I should do. How do you break a cycle? Whether you're talking about the cycle of anxiousness and low productivity, or the larger cycle of ignoring feelings and not knowing how to deal with them? I don't have a real, solid answer for this question. But if a friend or a student or a camper asked me, I would tell her that I believe that this, as in this sort of post, is the start of an answer. Maybe, rather than jumping back into your work, and expecting yourself to ignore your negative feelings, you need to acknowledge and openly discuss those feelings. Even when it feels like no one else wants to hear (or read) about your feelings, and especially when you feel like you can't talk to anyone about them. I would write this blog as I normally do if I could. I miss being able to focus on shows and bands and the people I know who are making music, zines, and other DIY media. But I think that first I have to learn to write about how it feels to not be able to write about the things that matter to me. You can't circumvent your own feelings, and there's no getting 'over' them, either. The only way out, it seems, is through.